The Damsel in this Dress Blog! : Damsel Holiday Time! Special Promotions Available! 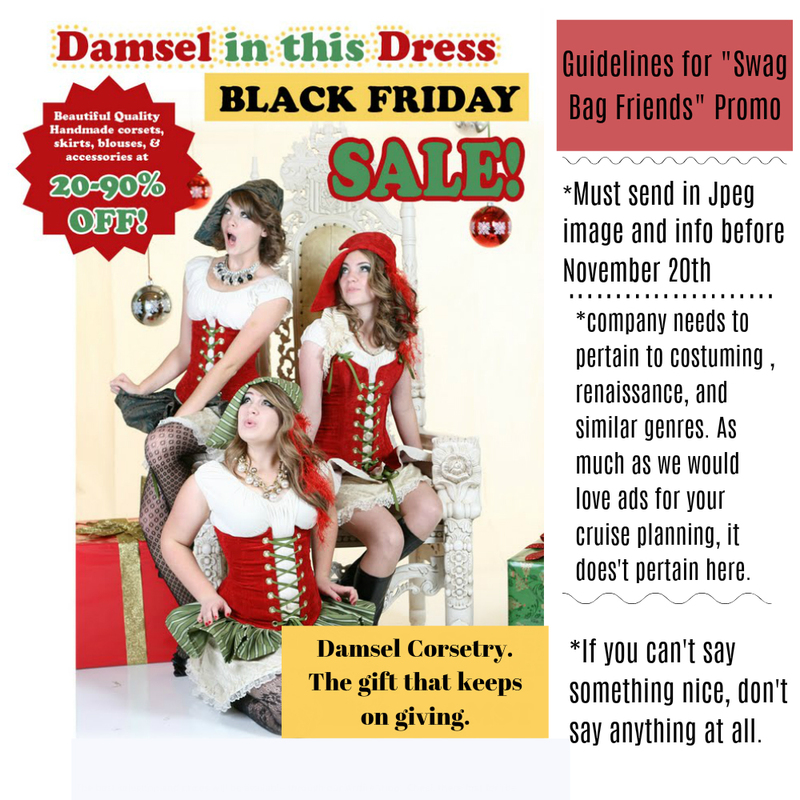 Damsel Holiday Time! Special Promotions Available! There are some great "Damsel" groups on facebook, but we still don't all KNOW the different shops and talents that are in this amazingly large and fascinating customer pool. I would love to have just a nice tidy LIST of shops and places where I could buy wares that are made by the very same people that support ME and MY COMPANY! I was thinking that it would be REALLY SWELL if all who are interested might want to put a nice little coupon of shop advert into my GRAB BAGS FOR THIS YEAR! So, not only would you get this amazing bag, (I am packing them up, and I'm already excited on your behalf.) BUT a neat pile of goodies (I am thinking bookmarks.....little look books, if your company does them.....anything you feel that you could do in this limited amount of time!) and the idea is that this EXTRA bag would be like the swag bags you get at really good conventions. My favorite swag in one of my con-bags was free tea samples, free little eyeshadow samples from a makeup company, and beautiful bookmarks for authors there. *If you have a company that makes things that you think would be awesome for our customers (yes, it has to be hand-made. Sorry, friends. ), I want tons of people to know about your fine wares. *I need to have all images, physical goodies, and goodness in my hands by November 20th. I know I didn't give you a lot of time. I have ideas quickly! *You get free promotion to several hundred REALLY good quality fans, and we spread the love to everyone. *My customers will hopefully feel more of a connection to each other, as they learn about other quality women and businesses and spread the word and referral love. Well there goes my paycheck. XD Can't wait!